Is KFD Spreading to More Indian States? If this Pune Mirror article is to be believed, then Kyasanur Forest Disease, a viral hemorrhagic fever, caused by the KFD virus, which belongs to Falviviridae, and is spread most commonly by the tick Haemaphysalis spinigera is spreading to areas where it was traditionally not found. Most commonly associated with Karnataka, with newer foci developing in Kerala, this disease is threatening to spill into the Western Ghats and into the state of Maharashtra. First reported from the Kyasanur forest area in 1957, this disease has slowly and surely started to increase in its geographic range. 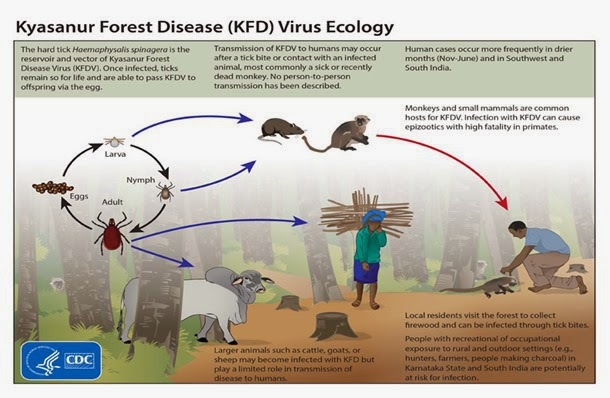 Tags: kfd, kyasanur forest disease. Bookmark the permalink.